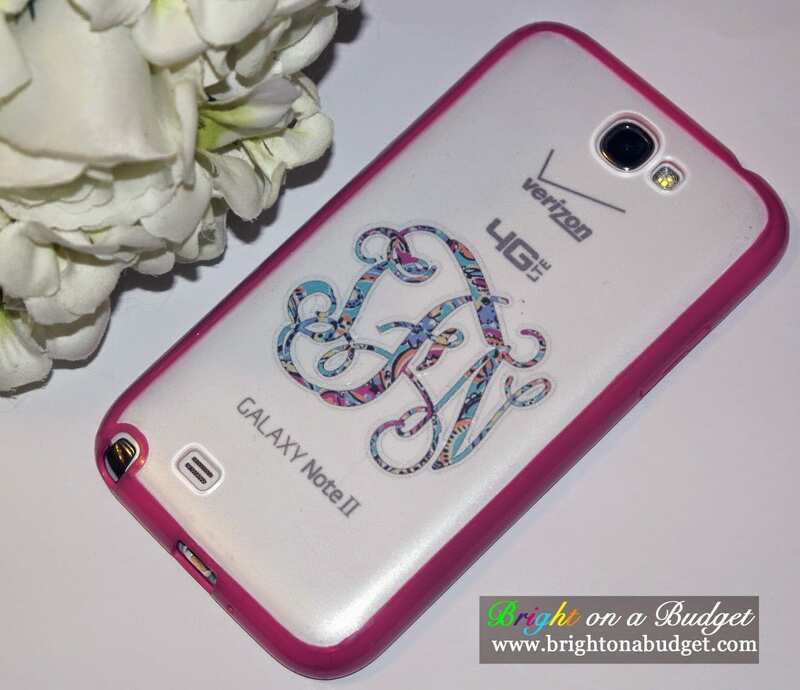 I love anything that is customized, especially if it’s customized with a monogram! What I don’t like, however, is the price tag that comes with customization. I was very unimpressed at pricing when I started looking for a monogrammed cell phone cover. Furthermore, I felt like those covers were not very durable (i.e., that would last maybe 2 rounds of my dropping them on the ground). Instead, I settled on getting just a plain hard silicone case in a bright color that I liked. Hard silicone cases are cheap and come in many different colors, but I’ve found them to be excellent phone protectors. I’m super hard on phones, so protection is a very important factor for me when it comes to phone cases. While browsing on eBay, I came across these cases that were brightly-colored on the sides and clear on the back. I like that they were clear, as this allowed my white phone to show through for a clean look. But then a lightbulb went off in my head–why not order a vinyl monogram, pop it on the back of my actual phone, and let it show through my new case?! Better yet, the cases were so cheap, I could order several and switch them out when I wanted something different, all for about the cost of 1 monogrammed case! 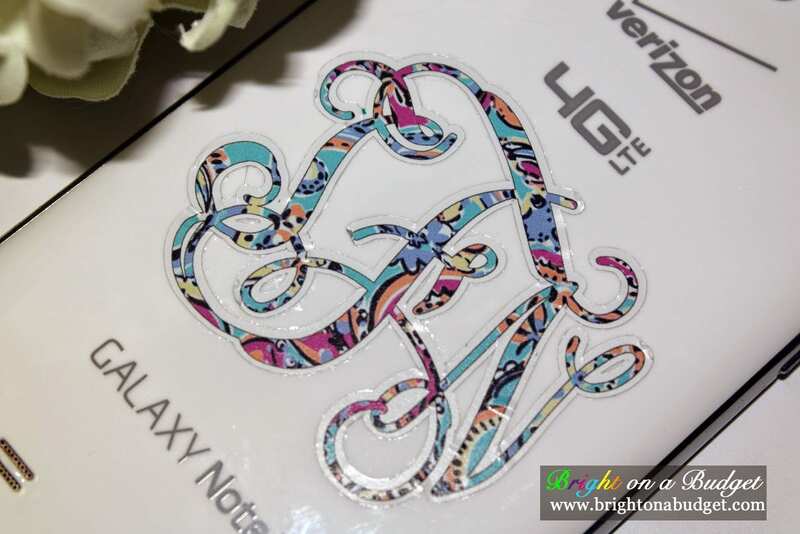 Vinyl monogram– 1.5″ or smaller for standard-size cell phones (Samsung Galaxy S series, iPhones) or 2″ for larger phones/phablets (Samsung Note series). 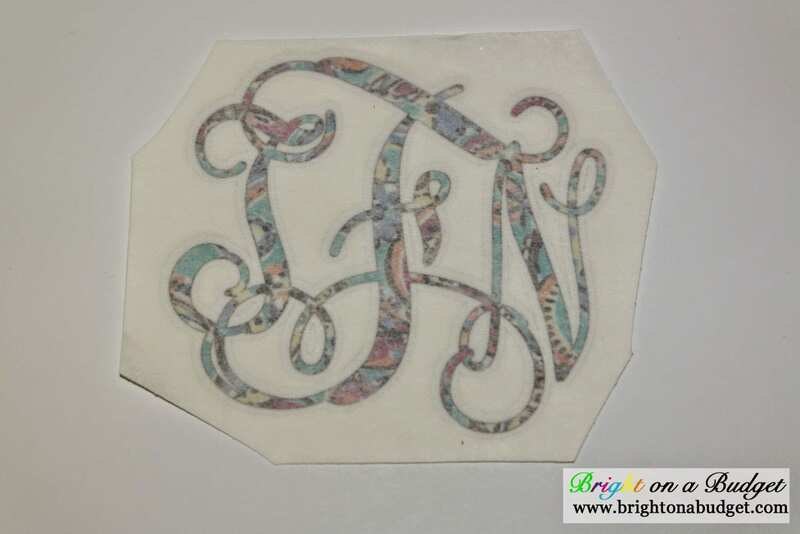 Various monogram fonts and colors— 1″ decal $2.00 shipped, 1.38″ or 1.5″ decal $3.00 shipped, 2″ decal $4 shipped. 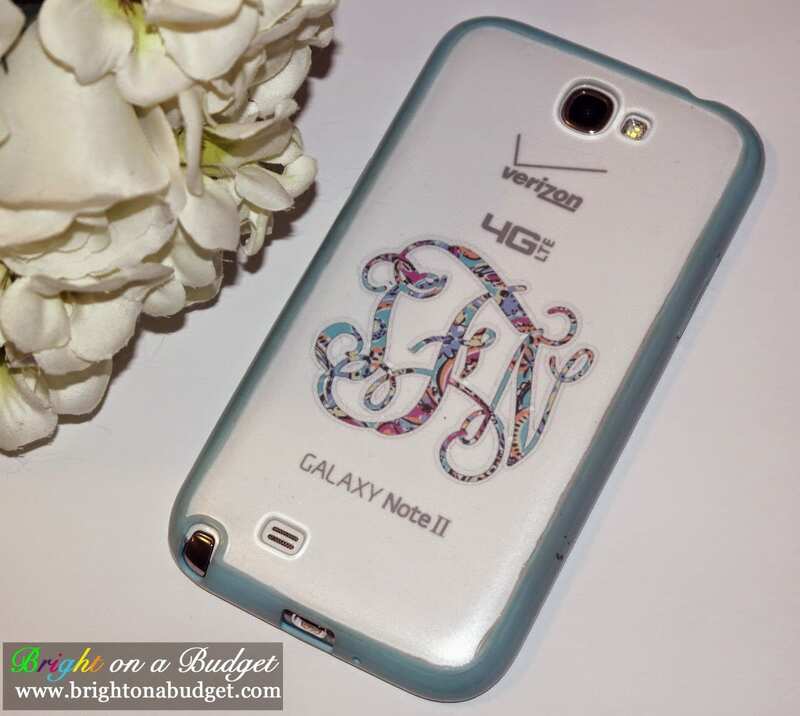 Lilly Pulitzer inspired monograms (like the one pictured on my phone)– 2″ decal smallest available, $2.95 shipped. Step 1: Make sure the back of your phone is clean. Step 2: Peel off the back of the vinyl monogram. Step 3: Carefully place the monogram where you would like it on the back of your phone and push down to make the monogram stick. I recommend simply centering the monogram. Step 4: If the placement is correct, run a credit card lightly over the back of the monogram to make sure it doesn’t peel up when you peel the cover off the front of the monogram. Step 5: Slowly pull the front cover off the monogram. Step 6: Pop on your new case! And change it at your leisure. Feel free to change the outside case as you like–since the monogram is on the actual phone, you don’t have to worry about getting a new one every time you switch cases! All done for way under $10! I really like the versatility of this option, as well as the super affordable price-point. Oh my! I have an S4 and have been wanting something more durable than my current cover, and well, this is going to be a definite! Love this DIY! Such a great idea and love how yours turned out! I love this DIY project! It's such a neat idea. I will definitely have to try it! Thanks, Katie! I couldn't believe I didn't think of this sooner! Caitlin, I really like this because of the versatility. I have 3 different colors of covers I can switch out! Thanks, Becky. I've done a plain monogram as well, but I like the Lilly one much better. Be sure to tag me in a pic of it when you do, so I can see how it turns out! You can also order a new back cover for cheap (so it doesn't show the carrier, etc), but I thought the monogram popped out well even with that. Thanks, Jill! I'm loving the pop of Lilly in the monogram! Thanks, Della! Be sure to let me know how it turns out–tag me in a pic when you do it! Such a cute idea… I love this! Thanks so much for sharing the idea! This is a fantastic DIY alternative to all the over-priced cases out there…great job!! Thanks! And you're right–they are overpriced! I'm getting ready to upgrade soon, but had no qualms about shelling out for a new monogram for this one since it was so cheap!